Emma saw something through the binoculars. A trail of bubbles headed toward the Peregrine. “What’s that?” she said, standing up and pointing. Something was swimming toward the boat. It looks like a dolphin, she thought. William suddenly noticed a dark, thin line of clouds on the horizon. “A storm’s brewing,” he said at the same time. Jonah was right! An enormous ship with ragged black sails appeared out of nowhere. A tattered crew ran back and forth along the deck. A moment before, the horizon had been empty. William and his sibling twins, Emma and Jonah, are enjoying an uneventful summer day sailing in the bay near their home when a series of strange events take place that launches them into a spooky, sea-faring adventure filled with zombie pirates, creepy mermaids, and a bizarre group of cursed ship’s figureheads. Fans of the short fiction series “Weird Stories Gone Wrong” will enjoy this fifth installment. Dowding spins another yarn exploring the weirdness lying just beneath the surface of a seemingly normal everyday existence. 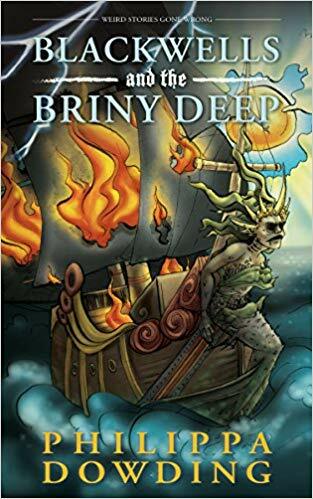 The realities of sibling rivalry combined with a spine tingling, mystery- adventure story make Blackwells and the Briny Deep a fun tale that fans of spooky stories will enjoy. Its fast pace, short chapters, accompanying illustrations, and simple use of language will also make it accessible to reluctant readers. Tabitha Nordby is a Readers’ Advisory and Reference Instructor in the Library and Information Technology Program at Red River College in Winnipeg, Manitoba.